At the crossroads of Baltic, German and Russian influences, the UNESCO protected Old Town of Tallinn is a rare blend of northern European history, culture and architecture. The large 13th century Town Hall and Square and Alexander Nevsky Cathedral are sheltered by ancient towers and sturdy walls dating back to the 14th century. And it?? ?s most elegant the hotel, the Hotel St. Petersbourg is warmly appreciated by discerning guests for its traditional service and discreet sophistication. It is the perfect base for discovering Tallinn?? ?s historic atmosphere, modern business centres and sightseeing attractions. Arriving at the Hotel St. Petersbourg is the start of a new adventure. The warmth of antique furniture, oriental carpets and plush arm-chairs extend their invitation to sit back and relax. The hotel has a long history of serving some of the region?? ?s most famous clientele. Built in the late classicist style, it remains the oldest continuously functioning hotel in Tallinn. First opened in 1850, it is centrally located in the heart of Tallinn?? ?s medieval old city. The name and dignity of the hotel have been lovingly restored and incorporate today?? ?s luxury amenities and state of the art service. It?? ?s timeless elegance and gracious welcome already holds the promise of a memorable stay, the feeling of comfort and harmony are welcome reminders of the good things in life. Epicurean offerings are paralleled by attentive service, 27 art deco style rooms, two on-site restaurants, traditional Estonian sauna, full valet service, hotel courtesy car with chauffeur availability and 24-hour reception. 27 guestrooms including 7 suites, each elegantly furnished in eclectic Art Deco style, spacious rooms with high ceilings and sunny fabrics. Room amenities feature such as writing desk, direct lines and phones, Flat Screen TV and DVD player. 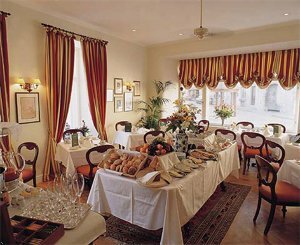 Restaurant Nevskij The very best of Russian kitchen and warm-hearted service in lavish and richly decorated interior. 35 seats in a la carte, 60 for stand-up reception. Restaurant Kuldse Notsu KÃµrts Estonian country-style restaurant serving traditional food and local beer in a rustic atmosphere. Authentic Estonian meals and central location in the heart of Old Town, just 75 steps from the Town Hall Square.